Researches on identifying germplasm with good traits and breeding hybrids through biotech won in the recent 2nd International Conference on Multidisciplinary Research in Higher Education in Zamboanga City. Collective Efforts and Interdisciplinary Approach to Rice (Oryzasativa L.) Conservation and Use in the Philippines was adjudged best abstract and best paper among 10 entries. 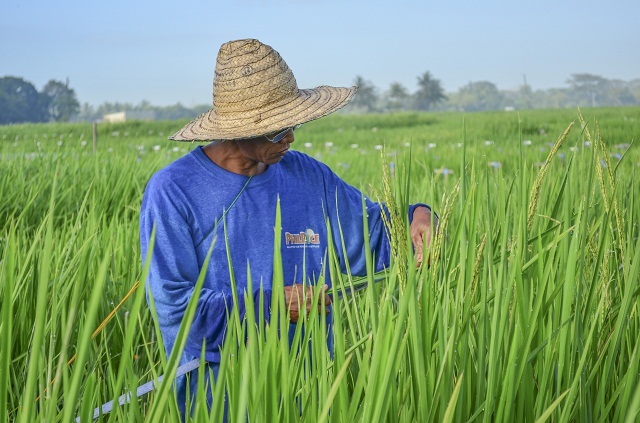 Xavier Greg I. Caguiat, lead researcher based at Philippine Rice Research Institute (PhilRice), said that the study uncovered rice germplasm that are resistant against ecological and environmental stresses. “We found that these germplasm stored at PhilRice Genebank contain degree of resistance to major stresses, which the breeders can use in breeding new rice varieties,” he said. PhilRice Genebank houses 16,000 rice collections. The senior research specialist said that close to a thousand varieties and lines kept in the Genebank are resistant and have intermediate reaction to rice blast. Moreover, the study showed that 400 germplasm have intermediate reaction to bacterial leaf blight while 27 have intermediate reaction to sheath blight. Two varieties or lines are resistant against tungro while six have intermediate resistance. Five varieties can also adapt to zinc-deficient soils. In surviving unfavorable ecosystems, the team found that 27 varieties and lines have potential to survive drought-prone areas; 16 can either tolerate or moderately thrive in saline fields; while about 20 can either tolerate or moderately cope flooding for certain days. Meanwhile, Joanne D. Caguiat won the best oral presentation for her study, Hybrids Developed from Anther culture-derived Pollen Parents Towards Increasing Rice Yield. Also a PhilRice senior researcher, Caguiat is breeding hybrid lines from anther culture, which is being used to speed up the development of male pollen parent. Working with other researchers, her team found that hybrid lines PR48755H, PR48758H, and PRs48765H produced more yield than the check varieties PSB Rc 18, Mestiso 19, Mestiso 48, and Mestiso 55. The hybrid lines yielded 7.1 t/ha – 8.6 t/ha while the check varieties only produced 3.3- 5.6 t/ha. “These parent lines will be utilized as donor sources while hybrids can be further evaluated in different multi-location and nomination to National Cooperative Test,” Caguiat concluded. The conference, organized by the Universidad de Zamboanga, was launched in 2009 to establish research culture among local and international research and academic institutions through sharing and exchanging best practices.